DETROIT -- MyFord Touch. Lincoln MKZ. C-Max. All were heavily promoted as innovative products that would help Ford Motor Co. pull customers from rivals and cement the company's position as a technology leader. Instead, each has come back to bite the automaker. Ford's stumbles have done little to slow its sales and market-share growth. But they have taken some air out of a company that had transformed its image under CEO Alan Mulally, becoming the darling of the Detroit 3 by shunning a government bailout and avoiding Bankruptcy Court. By reducing the EPA fuel economy rating for the C-Max Hybrid by 9 percent last week, Ford hoped to contain a controversy that has dogged it for months. Soon after the C-Max went on sale in September, owners, lawyers and the news media, including Consumer Reports, criticized the car for falling well short of the 47 mpg at which it was rated by the EPA -- a number Ford trumpeted in its marketing campaign. The company said it would pay C-Max buyers $550 and lessees $325 to compensate them for higher-than-expected gasoline costs. But Ford offered no apology, saying it adequately followed the EPA's guidelines. In a press release, the company said it made the move "to improve customer satisfaction." Ford's admission that it had not tested the C-Max, instead invoking a rule that let it use numbers for the Fusion hybrid, only adds to the company's list of recent problems. Although Ford sales and profits have been booming, the company has been struggling with a heavy schedule of vehicle launches. Ford's efforts to revive its Lincoln brand have been fitful. Nearly three years into the latest revitalization plan, Lincoln dealers still have only one new vehicle, the MKZ. Parts shortages and quality problems have disrupted the company's launches, most notably that of the MKZ, which was about four months late. Ford's new designs, particularly the high-volume Fusion and Escape, have been hits in the marketplace, but recalls hampered both vehicles' launches, and the company is struggling to keep up with demand for the Fusion. Green, with the complaints that the hybrids didn't live up to EPA labels. Smart, with the design problems that led to widespread dissatisfaction with MyFord Touch. Quality, with the recall problems of the 1.6-liter EcoBoost engine, the botched launches and the huge drops in quality rankings issued by Consumer Reports and J.D. Power and Associates. The C-Max was the industry's worst-scoring model in this year's J.D. Power Initial Quality Study, sources told USA Today. The string of missteps has surprised many industry observers after Mulally appeared to have the company on such a smooth path. The company has made a strong effort to meet the problems head on. After complaints about MyFord Touch, the company has engineered a series of software tweaks to improve the system. It has also promised to put more buttons and knobs back into some vehicles. Ford changed the software in its hybrids to make them perform better in real-world conditions. "We're committed to deliver the highest quality vehicles to our customers," said Said Deep, a Ford spokesman. "If we see something we're not going to wait; we're going to make it right. Other OEMs have been less aggressive in this area." Deep said MyFord Touch, which has been upgraded several times, attracts many buyers who love their vehicles. "We're pushing the envelope," Deep said. "We're going to continue to be innovators and leaders when it comes to in-car entertainment because that's what customers want." Ford has also taken steps to address launch problems, hiring new engineers at its plants and instituting procedures to catch problems early. Ford is now using a new worker training program at its plant in Flat Rock, Mich. But cutting the C-Max Hybrid mileage ratings is a blow to Ford's carefully cultivated image as a fuel economy leader under Mulally. Ford used the 47-mpg number as the centerpiece of its C-Max advertising. Beginning in October, it broadcast a series of playful animated commercials that pitted the C-Max against the rival Toyota Prius v, which has an EPA combined rating of 42 mpg. But Ford's fuel economy claims ran up against customers' real-world experiences. At least three lawsuits were filed against the company on behalf of consumers who alleged that Ford misled them. One suit, filed in California, was dropped in February. Suits seeking class-action status that were filed in Pennsylvania and Massachusetts are ongoing. The Ford Fusion and C-Max hybrids fell 17 percent to 21 percent short of Ford's promise of combined 47 mpg in testing last year by Consumer Reports, which uses a different testing cycle from the EPA. The Fusion achieved 39 mpg and the C-Max averaged 37 mpg in tests of city and highway driving, the magazine found. Other hybrids also fell short of their manufacturers' claims, Consumer Reports said, but none more so than the C-Max and Fusion. Fuelly.com, a Web site that lets drivers track the fuel economy of their vehicle, shows the average rating of the C-Max as 40.2 mpg, based on data from 256 drivers collected over 1.6 million miles. Raj Nair, Ford's head of global product development, said Ford's decision to compensate C-Max owners "is a sign of good faith with our consumers." 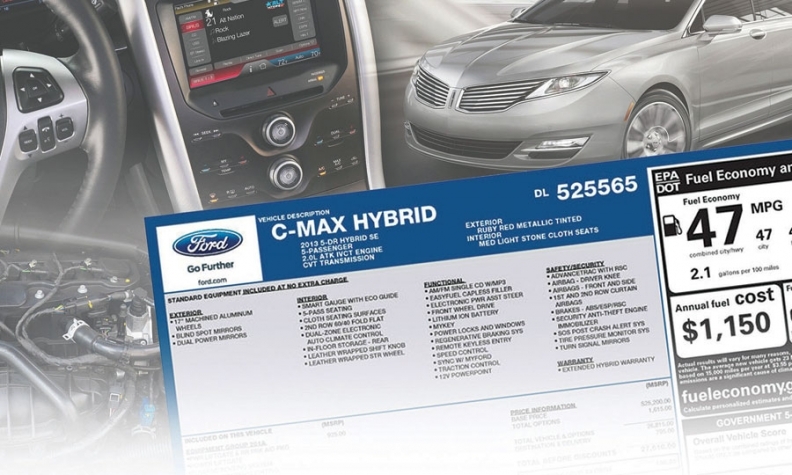 The payments will cost Ford $10.4 million to $17.6 million, based on deliveries of about 32,000 C-Max Hybrids. "We're making a good will payment to consumers showing our commitment to customer satisfaction," Nair told reporters last week. But when pressed on whether Ford owes buyers an apology, he walked away without responding. A version of this story will appear in the print edition of Automotive News on Aug. 19, 2013.